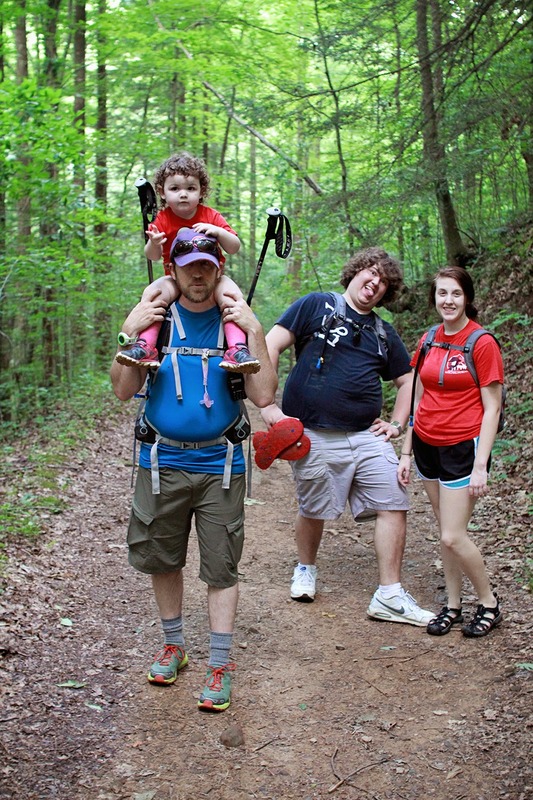 It wasn't long before we were in full swing of getting things ready to go for a hike up in the Smokys. At least that was the original plan. After getting everything ready to go which seemed to take forever as does anything when Bug is involved, not to mention that I'm notorious for packing more than is necessary for our hiking adventures, we packed ourselves in the vehicle and started to make our way to our destination. We were only a few minutes into the drive when we realized that the weather wasn't going to be conducive for hiking in the mountains. It didn't take us long to come up with a new plan, our fail-safe, our go to when all else fails, Frozen Head. 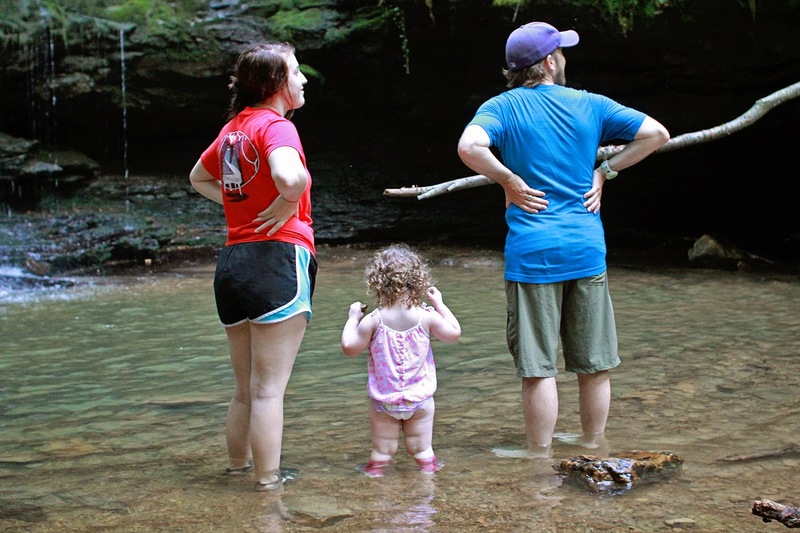 It seemed that it would be great day to take the kids: Bug, Kiddo, and her Beau to Debord Falls via Panther Branch Trail to let them romp in the pool at the base of the falls. We opted to take the long way around to get to the park, this would allow Bug to get a good nap in before reaching our new destination. By the time we arrived, we were all ready to get out and stretch out our legs on a nice little trek. We got all geared up and were underway. It didn't take long for Bug to spot the creek we had to cross over at the beginning of the trail. She has a thing for water, we tease that she's a water witch because if there is water to be found, she'll find it no matter how little there is our how hard it normally would be to find it. 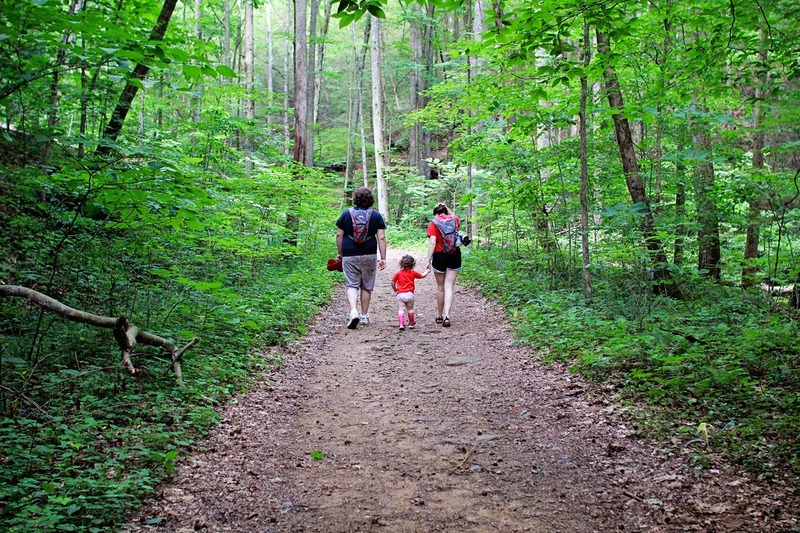 Now anyone with kids, small kids know that they don't go very far and easily get distracted. However on this hike I have to say, I was quite amazed that Bug took a good while before she really got distracted. 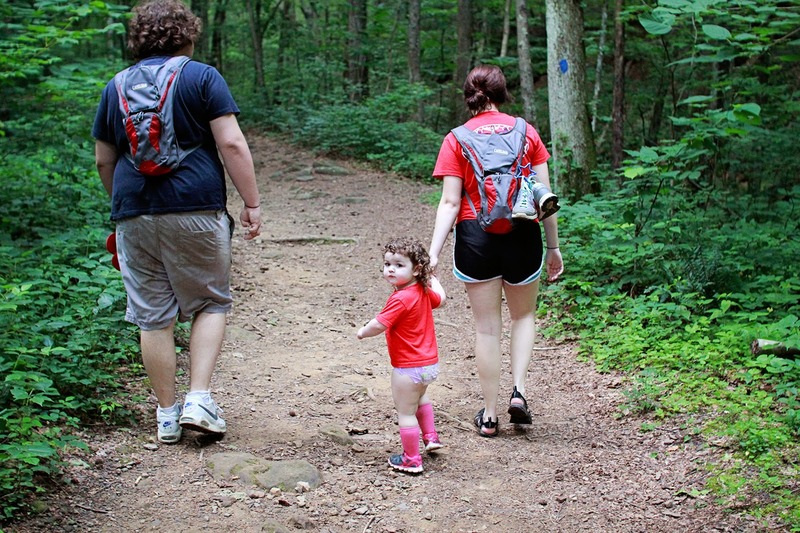 As she likes to proclaim, she is naturally a "Little Hiking Girl". Two and a half years old and she can easily hike a mile on her own power. Today she made it about a quarter mile before she spotted a small trail to a little pool area in the creek that runs alongside the trail. 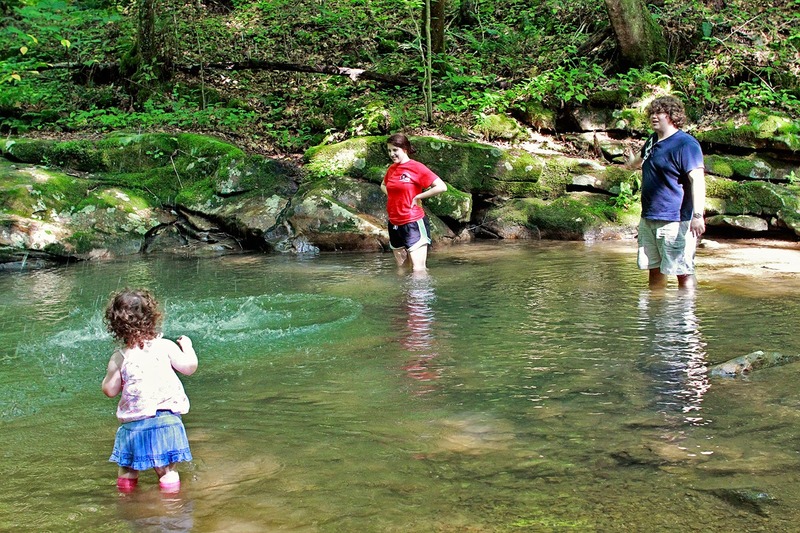 So we opted for the pull off for a chance to let the kids play and enjoy the surroundings and the cold creek water. 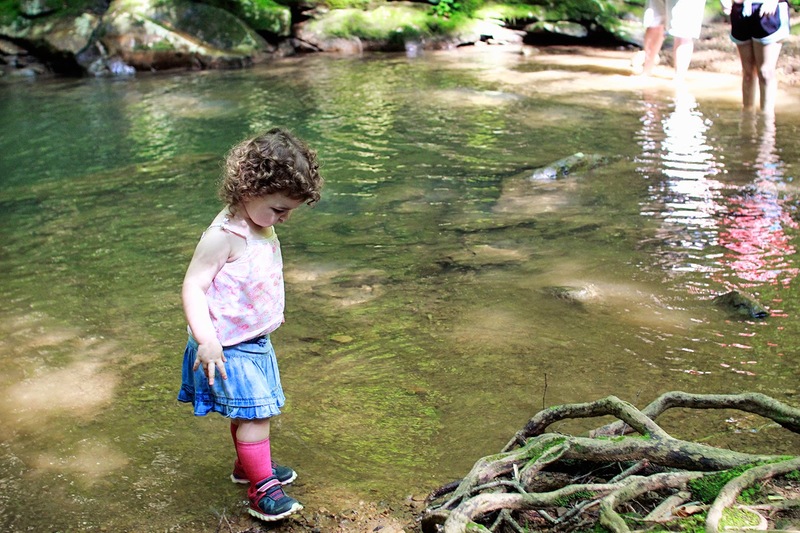 Bug had a blast splashing around and throwing rocks into the creek and as always playing with her sissy. I know Kiddo had fun. 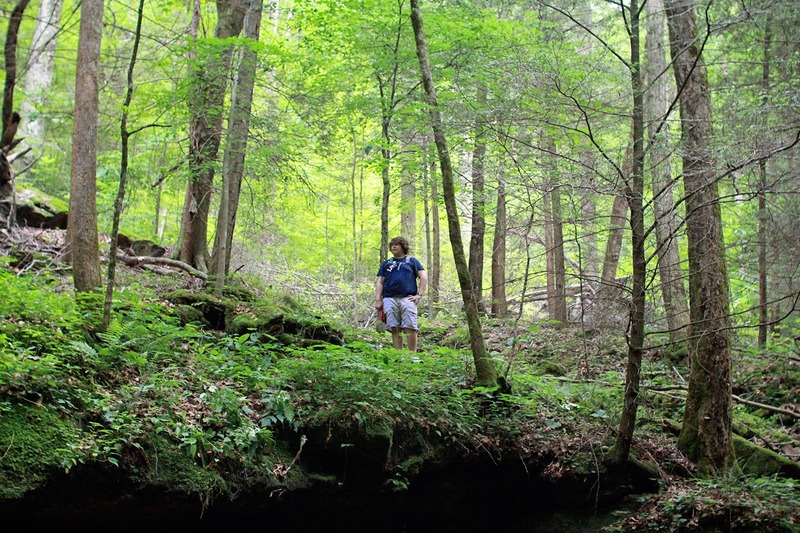 Her beau, while not inexperienced in the outdoors, he hasn't had much experience hiking just to hike. Nevertheless, I think he was enjoying the trip as well. We let the kids play for a bit while Robin and I soaked in the scenery, took photos of the kids, and of some new gear we were testing out, for instance the Life Straw, a new photog backpack from Lowepro, and a camera sling strap from Joby (Those reviews will be coming soon so stay tuned). After a bit, we got Bug all dried and ready to hike a bit further up to Debord Falls. She was walking with Kiddo and her beau, while Robin and I trailed along behind them. It wasn't long before Bug was ready for a ride on Daddy's shoulders. I don't think that she was tired, I think rather she just wanted a Bird's Eye view of the trail. It didn't take long though before we reached the cutoff from the trail and the stairs down to the waterfall. I believe Bug was in awe of the site before her. 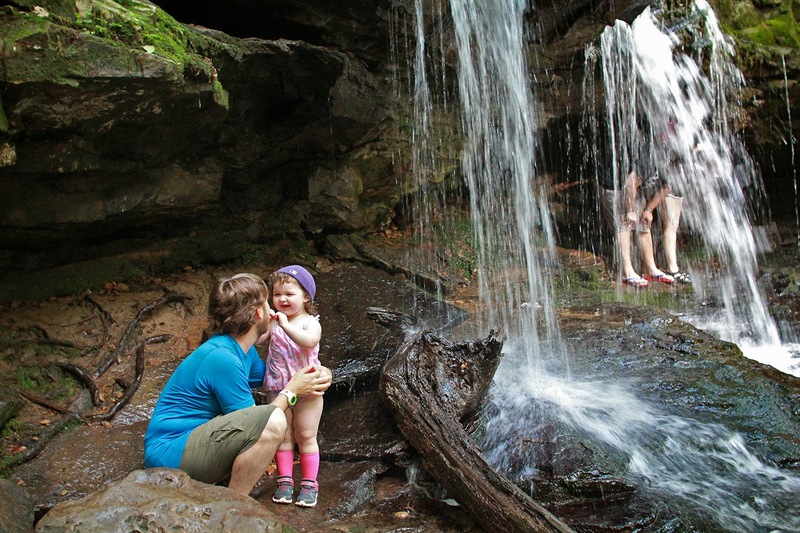 As a matter of fact, I believe this was her first visit to a waterfall. It didn't take long before she was ready splash and play in the water again. This time, I took my shoes off and joined her. Robin was more than happy to take photos and just enjoy watching us play. 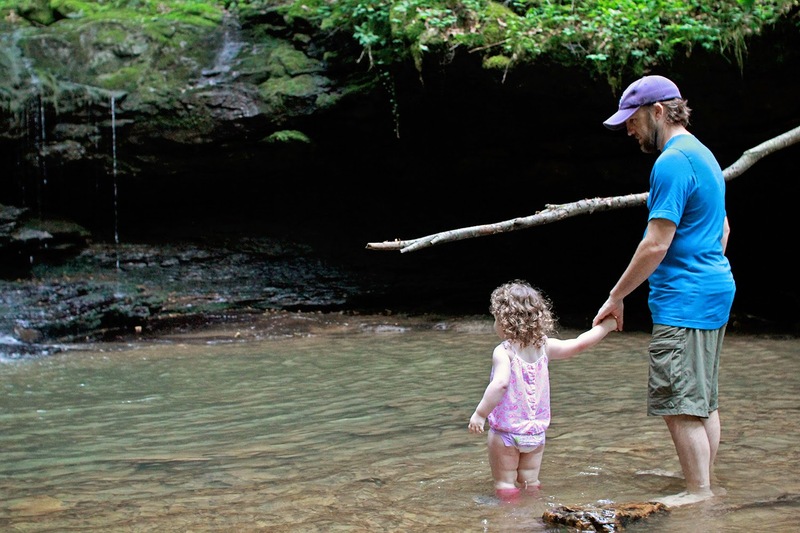 We must have stayed a good hour or more just exploring and playing around the waterfall. Dinah finally got brave enough to get next to the waterfall to let it splash on her. She was completely soaked along with the other two. I was only partially wet. As much fun as we were having though, we knew that the daylight would only last a couple more hours and it was time to head back. We made our way back down the trail. Towards the end, and because it was all downhill, Bug and I decided to trot/run the last tenth of a mile or so (She's itching to run trails with her daddy). We made it back to the car and headed back to the homestead, but not before a brief stop for 1/2 price shakes as a trail treat. It was the best Father's Day Ever.